I have talked to many clients who were surprised that their driver’s license was suspended from past unpaid bills. The most common cause for this suspension is from a car accident resulting in money damages that has gone unpaid. In most cases filing for bankruptcy protection will restore the driver’s license. The bankruptcy discharge does not get rid of debt incurred for damage caused intentionally or as a result of a DWI. It also does not get rid of government fines or fees. 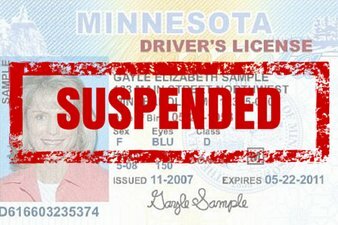 Minnesota Statute Sec 171.18 gives the reasons why a driver’s license can be suspended these reasons include judgements related. For many people the driver’s license is essential for getting to work to earn a living, so if it is taken away, it makes it difficult to pay everyday bills. If your license has been suspended we can help you determine if bankruptcy is an option to get your license restored. It has worked for a number of our past clients. The other types of debts that bankruptcy cannot help you get rid of are child support payments, student loans, some tax debts (including withholding or sales tax debt), luxury goods or services over $500.00 in the 90 days before filing, or cash advances or $750.00 within 70 days of filing, or loans taken out due to fraud. It is important that credit cards are not used before filing, to avoid any problems with the bankruptcy discharge. I have never had an issue with clients intentionally charging on cards before filing for bankruptcy, in most cases the charges are needed to just cover basic living expenses. In other cases the credit card debt is years old and the clients have not had recent charges on the cards for years. It is amazing how small charges can add up with fees and 30% interest over a few years, then you add in court costs and a $1,000 bill can turn into a $10,000 bill in a number of years. These fees can even be added when your debt is sold to a third party. In most cases the first creditor will charge off your debt for tax purposes, and once they sell your debt the debt buyer will add in interest and fees under the original contract. Generally the longer a person has been paying on credit card debt, the more they owe, especially if they are making minimum payments on a card, and continuing to charge on the cards. If you have questions about these issues or office is available to help you get the answers. In most cases, clients do not realize that some tax debt can be wiped clean by bankruptcy. It is important to get good advice before filing for bankruptcy, and know all of your options before deciding on any single option. In some cases the debt may be too overwhelming to pay back. We have helped clients get back on solid financial footing by offering sound legal advice. We enjoy hearing from our past clients about the success they have with good credit and no debt post-bankruptcy. In many cases, the clients wish they would have filed for bankruptcy years before they actually filed.